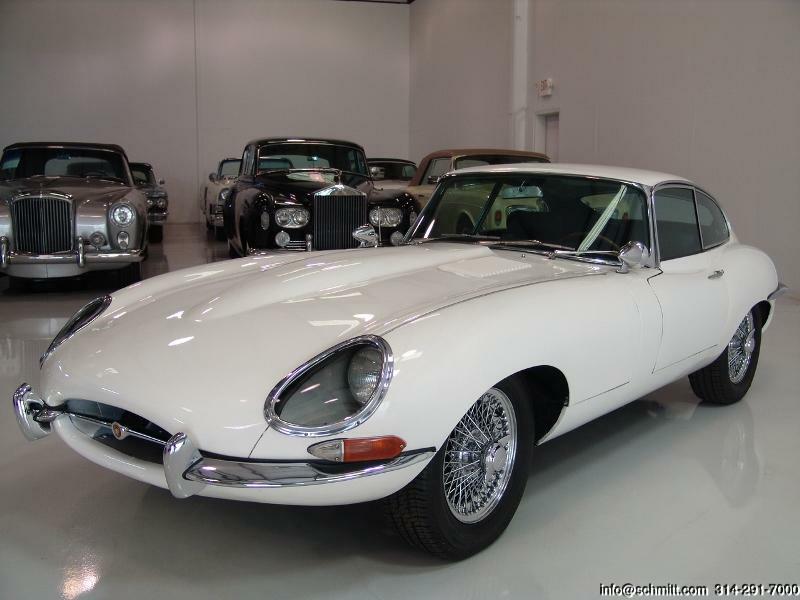 1965 JAGUAR XKE 4.2 COUPE WITH A BEAUTIFUL COSMETIC RESTORATION – Daniel Schmitt & Co.
A family tradition for over 50 years, selling classic & fine motorcars throughout the world. Finished in classic and desired English White with impeccably kept Dark Blue Leather interior. This spectacular motorcar is the rare and sought after 4.2 coupe with all the right options including 4-speed transmission, chrome wire wheels, leather interior and more. This spectacular motorcar has been recently restored and is among one of the finest examples we have had the pleasure of offering in many years. Seldom does one come across such a spectacular car as this. I truly believe the investment potential of these Jaguars will grow far beyond your imagination. To find an example in this condition and color combination is truly a wonderful find. Offered to the most astute collector, investor or enthusiast who only wants the best. 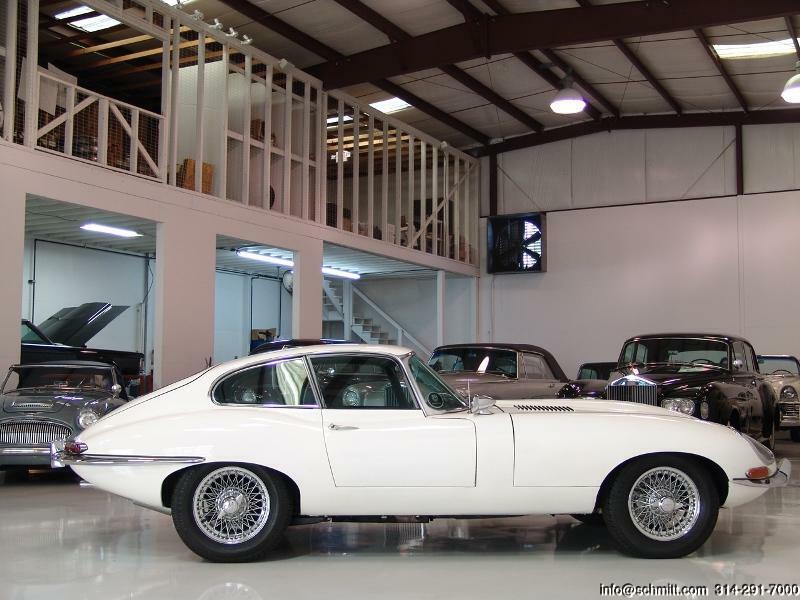 Bid with confidence - you will not be disappointed in this truly wonderful motorcar. Although we believe the mileage to be true, because of the age of the vehicle, we cannot guarantee it. 5 year / 100,000 additional Miles Powertrain Warranty! Daniel Schmitt & Co. is located in beautiful and historic St. Louis, Missouri. Our dealership spans 4 acres, boasts 3 luxurious showrooms, a state-of-the-art service department, a world-class restoration facility, and is only minutes away from Lambert International Airport. While we offer our cars for online sale and auction, we do also encourage you to visit our beautiful classic car showroom! Why buy from Daniel Schmitt & Co? Family owned and operated for over 50 years, we are a classic and luxury car gallery, committed to delivering some of the rarest, highest-quality classic cars, to customers worldwide. Throughout the years, our classic car dealership has built its reputation as one of the most trusted providers of classic cars to enthusiasts, collectors or investors. We offer truly unique and beautiful motorcars for sale. As Daniel Schmitt & Co. reviews will attest, we focus on providing a world-class automobile shopping experience with thorough descriptions and detailed images - an absolute must in the digital age, when many of our classic and investment cars are sold online. Please feel free to contact us with any questions you may have. Finance rates as low as 5.9%. We know that classic car financing can pose a unique challenge. Although a vintage or exotic car can be an excellent investment, some financial institutions attempt to apply standard “used car” rules for financing a classic car, which in many cases can make loan approval difficult. We work closely with many banking institutions that understand and recognize the collector value of classic cars and view them as an investment, which allows us to help you get the financing you need so that you can have the car you have dreamed of. * Rates vary depending on year of car, length of term and credit score. Daniel Schmitt & Co. is a proud sponsor of M.A.D.D. Warranty Available. Please inquire for more information. Door-to-door national and international shipping arrangements are available. Please note: Shipping costs are the responsibility of the buyer. The prices listed in our ads are only shipping estimates, not the actual cost. Shipping costs vary depending on vehicle size, fuel prices, and carrier type. Vehicle may be sold by our dealership before the end of auction. Daniel Schmitt & Company has described the above-mentioned vehicle to the best of our ability. However, as with all pre-owned automobiles, the condition is subjective, and we recommend that the potential buyer fly out to inspect, as well as test drive any of our vehicles before finalizing their purchase. If it is not feasible for you to personally perform an inspection, we will gladly help facilitate an inspection by an independent service center of your choice and will make delivery arrangements of the vehicle for this purpose. All vehicles are sold in “AS IS” condition. Extended warranty options are available on most vehicles. Please be advised that no verbal statements concerning any vehicle constitutes a representation or warranty of said vehicle. Our goal is to provide you with the best service and buying experience as possible. All purchases include an additional $385 processing fee which covers the processing of paperwork, pre-vehicle delivery costs, FedEx shipping fees, and a 30-day temporary registration plate so that the vehicle can be driven prior to the title transfer. (ATTENTION INTERNATIONAL BUYERS: Please be aware that you will be responsible for the Federal Reserve fee(s) charged for all incoming wires). In regards to winning bidders and Buy It Now customers: All winning bidders and Buy It Now bidders are encouraged to fly out and personally inspect the vehicle. If you deem the vehicle is not as represented upon personal inspection, we will not only refund your deposit, but will also reimburse your airfare at the cost of a coach ticket. Feedback must be left at the time of delivery upon final inspection. Pertaining to non-eBay winners: Anyone who has provided a deposit but whose purchase is still pending, please note that said vehicle will not be held and is subject to being sold at any time until all contingencies are removed and the purchase order is signed. The advertised mileage represents the actual miles when the car was posted online. These vehicles are test-driven and actual mileage may vary at the time of sale. All used vehicles should be assumed to have some degree of wear. We do not manufacture our product. Each vehicle’s brand has its strengths, styles, tendencies, and shortcomings. Despite our best efforts to verify a vehicle’s mechanical condition, we are not able to warranty a manufacturer’s workmanship or a previous owner’s diligence in care of said vehicle. Due to this reason, all vehicles are sold “AS IS”. There are no mechanical guarantees, expressed or implied. Daniel Schmitt & Co. reserves the right to end the auction at any time. Whether you are looking to buy a foreign exotic car or a premium American classic car, Daniel Schmitt & Company is ready to help you find the automobile of your dreams. You will find a wide selection of vehicles in our classic car showroom, which is located in the beautiful and historic St. Louis, Missouri. We offer pre-purchase inspections of any car upon request. Call or e-mail us today to arrange a test drive.